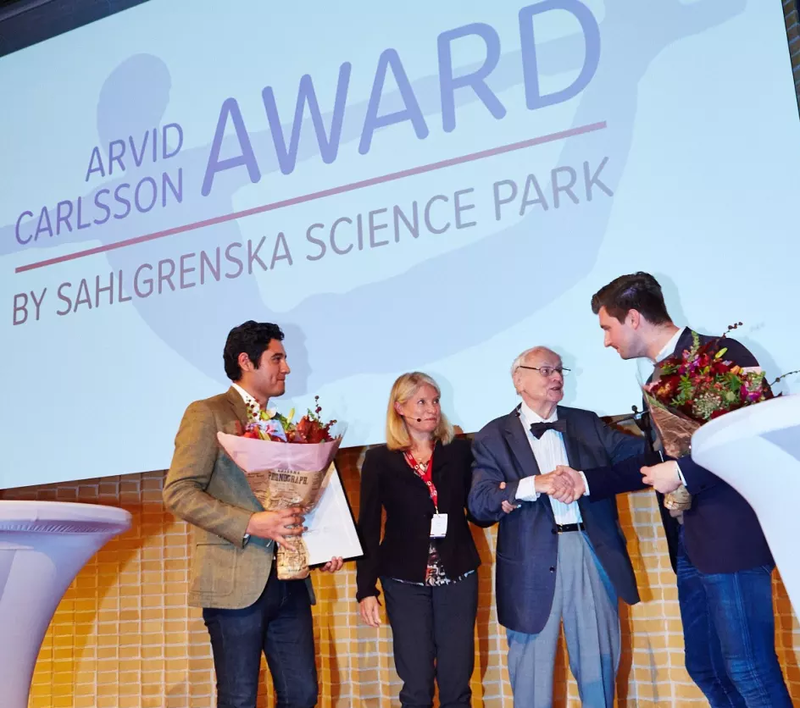 The premier of the Arvid Carlsson Award by Sahlgrenska Science Park took place during festive forms at this year’s life science event in Gothenburg on September 27th. Nobel laureate Arvid Carlsson handed over the walking prize to Erik Gatenholm and Hector Martinez, CELLINK, at Park Annual, where about 500 life science stakeholders participated. – Erik Gatenholm and Hector Martinez are driven entrepreneurs with the ambition to make the life science industry more sustainable. They have developed CELLINK into one of Sweden’s growth rockets by consciously investing in building the right team and reaching out in the world, says Charlotta Gummeson, CEO of Sahlgrenska Science Park. The award is to be awarded annually to an entrepreneur who drives the progress towards human health and welfare. The jury’s motivation for Erik Gatenholm and Hector Martinez in 2017 reads: It is well known that it takes time to reach out with a life science product on the market in a complex regulatory environment. Nevertheless, the winners have built one of the fastest growing life science companies in Sweden, with an international and sustainable mindset right from the start. In true entrepreneurial spirit, the others inspire daring to believe in their ideas. With the future ahead, they dare to blow up boundaries by collaborating and building a strong team for successful business worldwide. Arvid Carlsson, awarded the Nobel Prize in Medicine in 2000 for his “discoveries regarding neurotransmitters” is still active in his company A. Carlsson Research at Sahlgrenska Science Park in Gothenburg today. "I am very happy and proud to give name to an award that strengthens and praises entrepreneurship while emphasizing the importance of long-term and constant skills development," says Arvid Carlsson. "This is an amazing honor," says Erik Gatenholm, CEO and one of the founders of CELLINK.